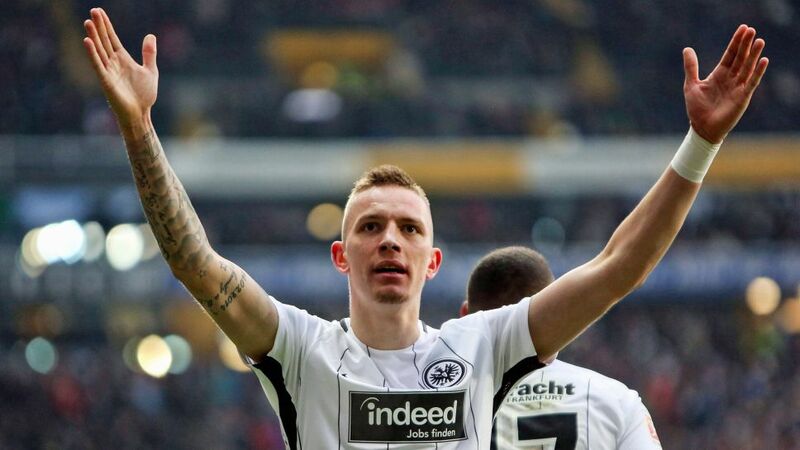 A brief glimpse into the life of Borussia Dortmund's newest young talent Marius Wolf reminds you that anything is possible in football, with the 23-year-old starlet journeying from Bundesliga nobody to one of the division's most sought-after stars in double-quick time. It's December 2016 in Hannover. A young, hungry and versatile player is knocking about in the fourth tier of German football with Die Roten's reserve team, trying to realise his dream of playing in the Bundesliga, The winger grows frustrated, disgruntled that his shot at the big time hasn't come. So much so, that he speaks to his parents and agent about his options. "When I was sent to the amateurs [at Hannover] it wasn't easy at all," Wolf explained to German sports publication kicker. "I was thinking, 'How come I'm not getting my chance? Why can't I show what I can do?'" He resolved to roll up his sleeves and press on, ever hopeful that his opportunity to shine would one day arrive. Luckily for Wolf, eagle-eyed Eintracht Frankfurt sporting director Fredi Bobic was on the hunt for a player with potential that could bolster his and Niko Kovac's squad for the remainder of the season. He saw the potential, raw determination, speed and strength of the disgruntled dynamo, as well as his wicked crossing ability and eye for goal. "I knew [going to Frankfurt] represented one final opportunity," Wolf recalls. Watch: Wolf torments Cologne with a goal and assist! Fast forward to the end of the recently concluded campaign, and Wolf ended up with a DFB Cup winners' medal around his neck to add to his eye-catching nine goals and five assists in the Bundesliga. Despite failing to make Joachim Löw's World Cup squad this time around, former Eintracht teammate Kevin-Prince Boateng believes Wolf will not tire of knocking at Die Mannschaft's door . "If he doesn’t become an international player, then I'll quit," Boateng insisted. One of the figureheads of Frankfurt’s success, Boateng became a close friend of Wolf’s almost immediately after the former Hannover man arrived in Frankfurt. The pair displayed their close relationship on the pitch - as did the entire team under Bayern Munich's new tactician - and became a representation of how hard work can take you above and beyond all expectations: with Wolf just one of many standout players during the Eagles' impressive recent run. "Kevin helped me a lot, showed me a lot and has given me lots of advice," Wolf said of his former teammate, the Prince having made his feelings clear to Marius from the moment they met. "I just told him that he has to go full throttle, and he does that. There's no stopping him," Boateng said. And it was with Boateng that Wolf realised just how far he has come, when he travelled to Milan to visit his friend. When the pair went for lunch in the city, an idol of Wolf's just happened to be in the same restaurant. Brazilian star Neymar, who they of course spoke to with Boateng's help. "My aim is to play against [Neymar] or even with him one day," Wolf told kicker. Dortmund's latest acquisition may now get that chance to line up against the South American trickster in the 2018/19 UEFA Champions League, with Die Schwarzgelben guaranteed entry to the tournament's group stage following their fourth-placed Bundesliga finish. It's a remarkable change from two years ago, and Wolf will never let himself forget where he came from. "I know what it's like when things aren't going well, like in Hannover," Wolf explained. "I'm just trying to keep pushing, and to not let it affect or unsettle me." Appearing far from unsettled in the DFB Cup final triumph against Bayern six days prior to celebrating his 23rd birthday, Wolf is revelling in the rewards that his hard work and determination have earned, with further success now almost certain to follow at BVB.